Round aluminum vents for your wall or ceiling are simply screw mounted into place. These round register covers have a steel damper in the back which adjusts for controlled airflow. Order the aluminum vent in a painted brown, white or black finish. If the round register cover is left bare, a clear coat will be applied for protection. The aluminum vent is great to use in bathrooms or kitchens since the faceplate will not rust. Classic Grilles Renaissance round register covers are all hand made to ensure the highest of quality. The aluminum vent is sand cast here in America and has a thickness of 1/4". Order the round register covers by measuring your duct opening in the wall and finding the corresponding size in the table below. Tip: The Renaissance aluminum vents are listed by the duct opening measurement in your wall. 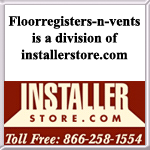 Do not order by measuring an old vent. 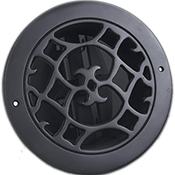 Our round register covers are made with an additional 2 inches added to the faceplate for mounting. Sizing is approximate and can vary between sizes. Important: Aluminum vents are made to order and are considered non returnable items which cannot be canceled once an order has been placed. Once a payment has been received, the item will be made and shipped between 7 to 9 weeks. Find more rectangular or round register covers made by Classic Grilles. The Renaissance aluminum vent for cold air returns is available with a screen backing instead of the damper. These round register covers are tasteful and well designed to help hide ductwork openings in your home; order with us today!